For the macaron recipé click here and for the method click here. 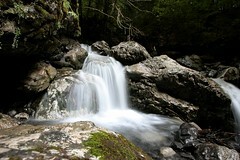 The beauty of it is its variety, and the diversity of people that I meet on a daily basis. Today was no exception. Again, leaving my teenagers fast asleep on a damp and dreary Mayday holiday, I was up with the lark to meet 20 or so visitors to Rouen from their cruise ship and head them in the direction of the INBP, otherwise known as the Institute Nationale de Boulangerie et Patisserie. 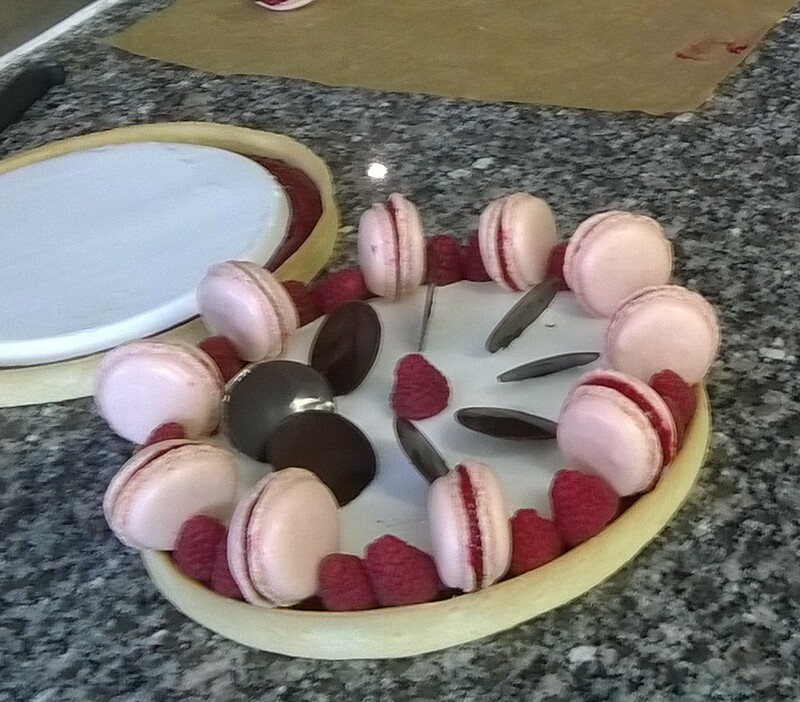 And as we all know, when you are looking for heat..
Today I stood alongside Sebastien in the demonstration kitchen, leaving the 20 strong group to settle in the auditorium for a cooking demonstration of a Tart à la Mousse de Noix de Coco avec Garniture de Framboise et ses Macarons. 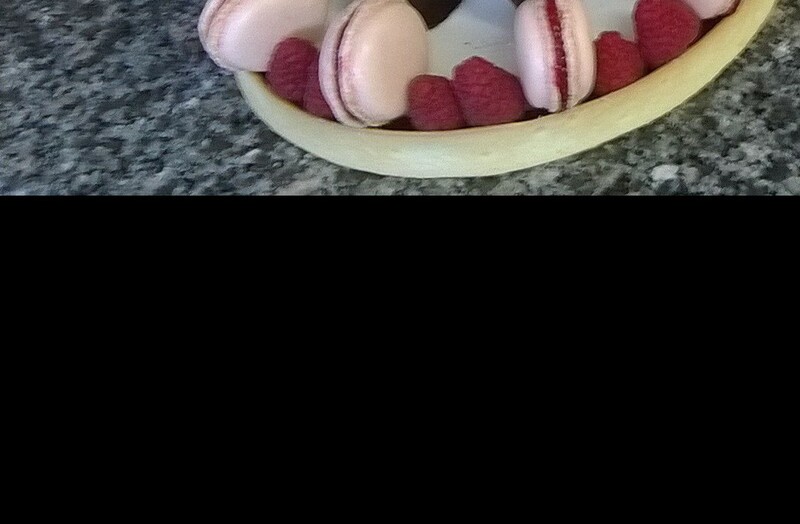 Coconut Mousse Tart with Raspberry Sauce and Raspberry Macarons. The INBP was created in 1974 and has 8000 students passing through its doors each year. 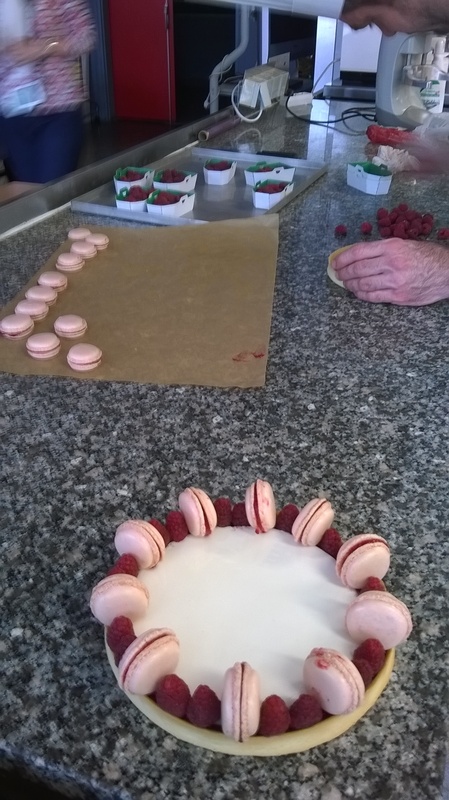 The training courses cover Boulangerie, Viennoiserie, Patisserie, Chocolaterie, Glacage (finishes) and Confisierie (sweet-making). 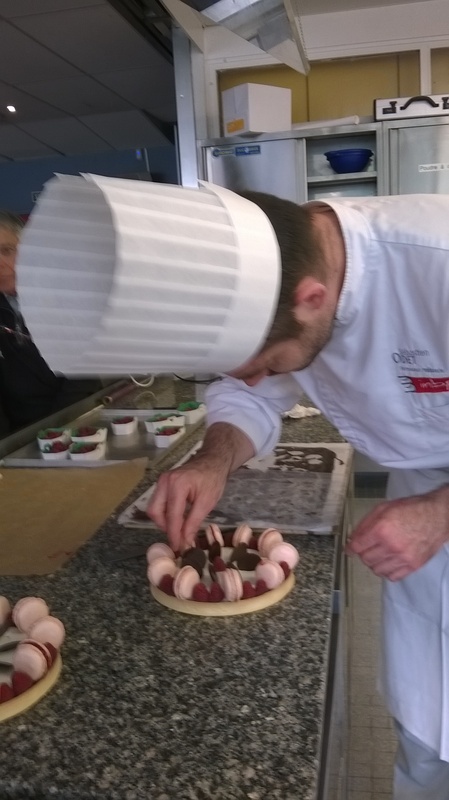 There are students who decide to change careers and join the INBP for accelerated training courses, and others that take the traditional ones, and of course the all too necessary competitions for Maitre patissier, boulanger or confissier; Le Coup de France and the Olympiad. Sebastien is French, and a self-confessed “nul” (dunce) in the english language! 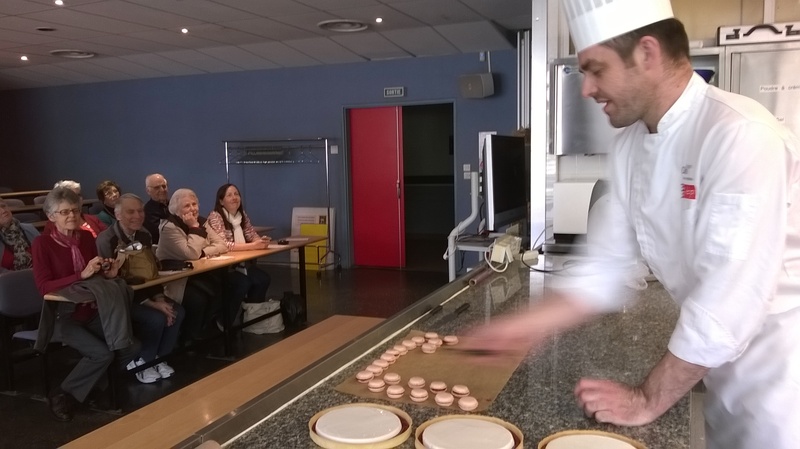 Personally, the opportunity to work along-side one of the “greats” of the patisserie profession translating his lesson from french to english for the participants is a win win situation. I get to learn the skills, and get paid for it – and what’s more have some left-overs to take home with me! With twenty in the class it isn’t possible to let each member of the group create from first basics. Sebastien did the lionshare but with plenty of opportunity for the group to get a bit of “hands-on” during the process. Look at Sebastien’s hands working with lightening speed! 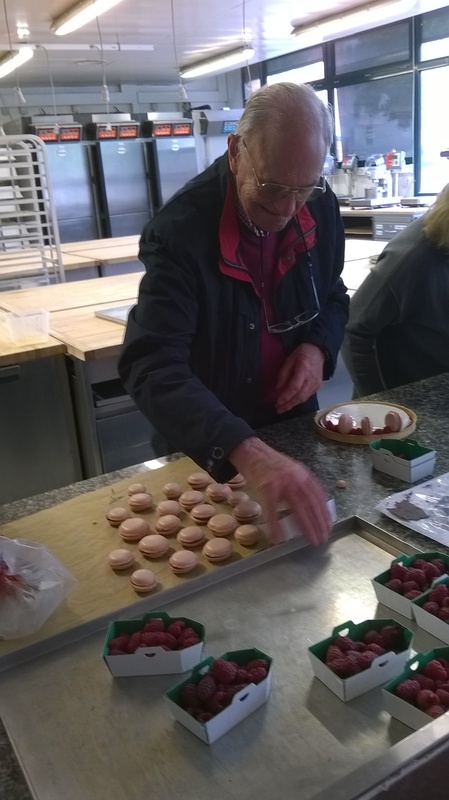 We started with the creation of macarons, the method for which is here and the recipe here. 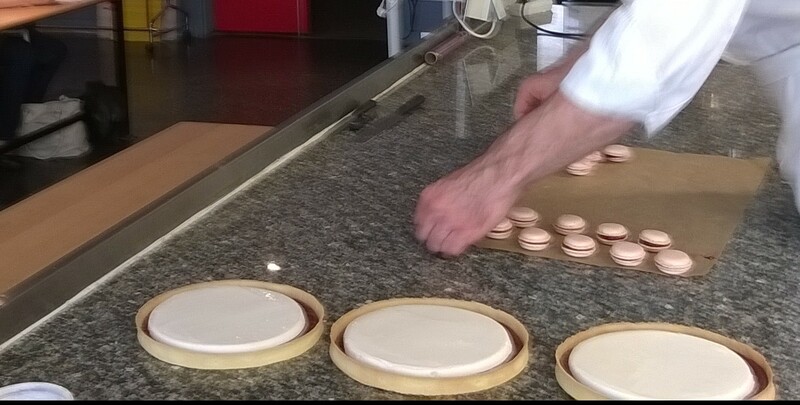 As the macarons were cooking in the oven, Sebastien showed us how to make the perfect pastry case. I couldn’t believe my luck. For years my pastry cases have always been my great failing. Not because I can’t make pastry, but because the cases are never perfect. I always have bubbles of air trapped between the base and the tin, and the colour is never even. We have a boulangerie close to home where the pastry cases are always a vision of perfection, perfectly square, perfectly smooth and an even golden brown. I have always wanted to know how they manage it and today I was in pastry heaven. 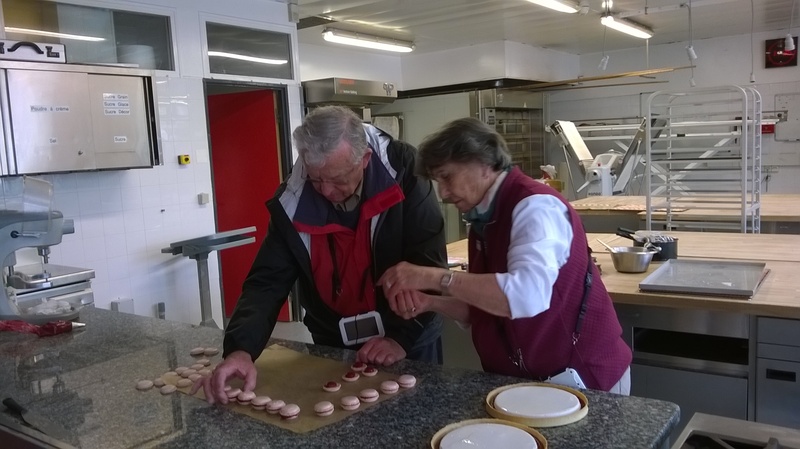 Sebastien started with a thin pastry round mould, and not a conventional tin. Secondly he used a wire baking tray as opposed to a flat sheet metal baking tray, and finally he lined the wire tray with a perforated silicone sheet. 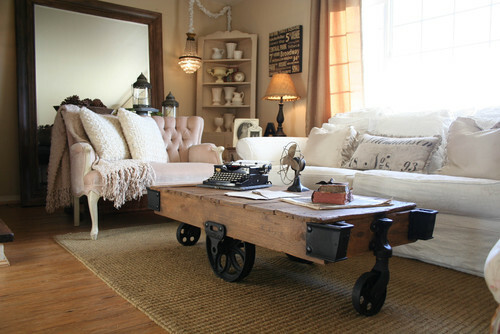 And this my friends is the secret. 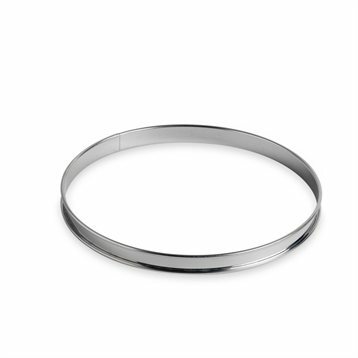 Any air that would otherwise form between the pastry and the tin simply dissipates through the air airholes in the underside of the silicone and wire tray. The next essential role in pastry making is not to overwork the dough. For those with warm hands it is essential to understand that the warmer the dough becomes, the more the oil in the butter used in the dough liquifies and creates a fatty pastry. Finally, the best pastry is created from well chilled and rested dough. Leaving the dough in the fridge for at least an hour, and up to a day makes for a crisp and perfectly delicious pastry. Having formed the pastry in front of our eyes, Sebastien reached into the fridge, and pulled out a ball that he had “made earlier”. 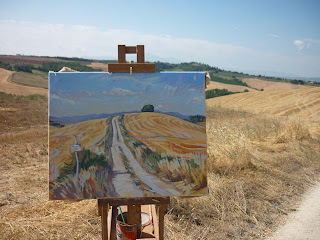 We ribbed him that he had popped into Carrefour supermarket on his way over, and he winked and assured us that he had got up at 4am to prepare it for us. We noted sagely the rings round his eyes! We made a mousse from pureed cream of coconut, whipped cream and gelatine which we poured in its semi-liquid form into a silicone mould and placed in the freezer to set. It was interesting to reflect on the fact that each country has cream that differs wildly from another. French cream is very liquid with reduced levels of fat. It is often difficult for the english in France to find cream that resembles that of their home country. But the fat content for a french patisserie recipe relies on a 30-35% volume of “matière grasse” or butter fat. In other words, France is virtuous for its “healthy” cream! “Je suis “perfectionist”” he said whilst we were hard pressed to see any faults through a magnifying glass! Using a piping bag Sebastien spiralled the raspberry sauce into the base of the pastry case, and placed on the top the now solidified mousse of coconut, which since frozen was easy to manipulate. It would thaw in the pastry case. 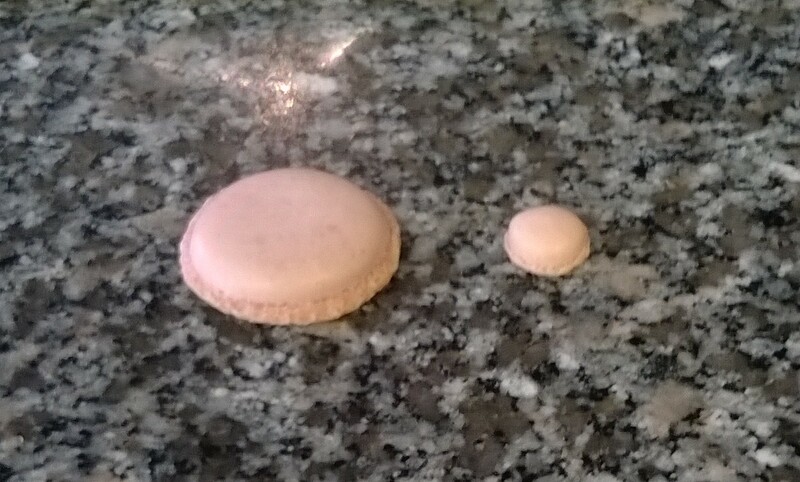 ” Mesdames, Messieurs, Faites attention que les coques soient tous le même taille!” – Ladies, Gentlemen, watch that the macaron shells are all the same size! But it goes without saying that the best part of all was when we cut the tart into slices for our own “degustation” (tasting) before reluctantly heading back to the ship.